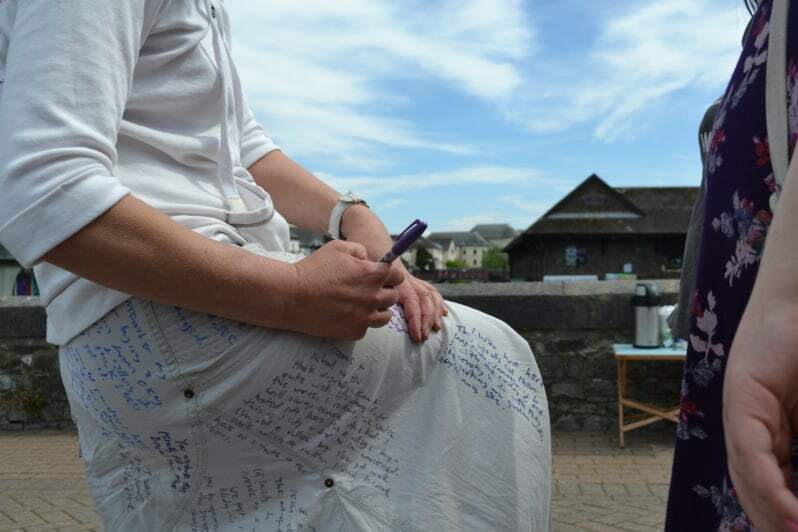 Over a couple of days in June, artists Davis & Jones, equipped with a portable cafe and some marker pens, approached people out and about in Haverfordwest inviting them to chat about their thoughts and memories of the town. The thoughts, memories, feelings, hopes and fears which people generously shared, were written by Davis & Jones on their clothes. Using The Random Story Generator, an idea devised with young people in Wiltshire, the stories were anonymised and grouped into Who am I?, What do I do?, This Place and Ideas. Reassembled here The Random Story Generator Haverfordwest creates 11,007,360 possible new stories; a quirky and illuminating portrait of this town. You’ll never see the same story twice! Many thanks to everyone who contributed and took the time to have a chat. The Random Story Generator Haverfordwest was commissioned by Confluence as part of a week long series of activities held in the Lab inviting people to look at Haverfordwest differently. Take a look at a short film by Sharron Harris documenting the making of the artwork. The Lab: Davis & Jones from curious ostrich on Vimeo.